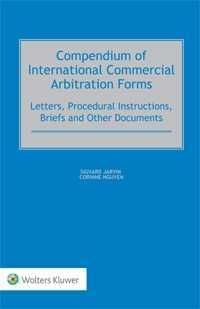 Compendium of International Commercial Arbitration Forms is a collection of documents used in international commercial arbitration, both institutional and ad hoc. International arbitration of business disputes continues to rise dramatically. New people entering the international arbitration community from all continents require a systematic guide to draft the arbitration documents. In light of this, this book, first of its kind, provides with numerous practical examples of the documents involved in each step of an international arbitration proceeding taken from actual cases, under different arbitration rules and in different countries. This allows actual ready-to-adapt forms to be located quickly for any issue likely to arise and clearly illustrates the different drafting styles used in practice. requests/decisions on correction and interpretation of awards. Explanatory comments on more complex forms help to raise the readers’ awareness on a specific issue or discussion. Emphasis throughout is on procedural aspects. No other book makes it so easy to find all the information necessary to prepare a case or take a decision in the context of international commercial arbitration. The readers can use these forms as such or adapt them taking into account the characteristics of their own cases and experiences. This compendium of forms thus answers the question of how to draft a form for a particular stage of arbitration. This book is of immeasurable value to corporate counsel, arbitrators and arbitration centres (especially newer ones in emerging markets), practitioners, lawyers and academics.